Dallas — Texas Central, developers of a high-speed train connecting Houston and Dallas, engaged the global construction and engineering firm Salini Impregilo – operating in the U.S. market with The Lane Construction Corporation – to lead the civil construction consortium that will build the Texas passenger line. Selection of the Italian firm, one of the largest civil engineering contractors in the world, reflects the participation of leading industry global organizations that are designing and building the high-speed train. Salini Impregilo is active in more than 50 countries on five continents, with experience building more than 4,000 miles of railway infrastructure around the world – in Australia, Europe, Asia and the Americas. It built many high-speed train projects in Europe, and some iconic, complex projects in the world in the wider transport sector, including the expansion of the Panama Canal. The company has worked in the U.S. since the 1980s and expanded its presence in 2016, merging with The Lane Construction Corporation, a U.S.-based company with almost 130 years of experience in infrastructure work. The announcement is the latest milestone for the investor-led project – a 200 mph train connecting the state’s largest population and economic regions in 90 minutes, with a midway stop in the Brazos Valley. The project will create a super-economy, connecting the 4th and 5th largest U.S. markets in fast-growing communities looking for safe, reliable and productive travel options. As the lead of the civil construction consortium, Salini Impregilo will be responsible for all work up to the top of the rail, including viaducts, embankments and drainage. Under the Limited Notice to Proceed (LNTP) agreement, the project’s design-build participants will proceed with the front-end engineering and design of the train’s civil infrastructure. Other services include optimizing execution approaches, strategies and logistics, as well as performing analysis to develop construction costs and schedule estimates. That work helps to develop a design build contract that will be used to complete the civil infrastructure program. This is a precursor to financial close, after which construction of the civil infrastructure segments of the project will begin. The agreement is the latest example of the project bringing the best subject matter experts to the team, creating a new industry in the United States. The train will inject an estimated $36 billion in economic benefits statewide over the next 25 years, including creating 10,000 jobs per year during construction and 1,500 permanent jobs when fully operational. 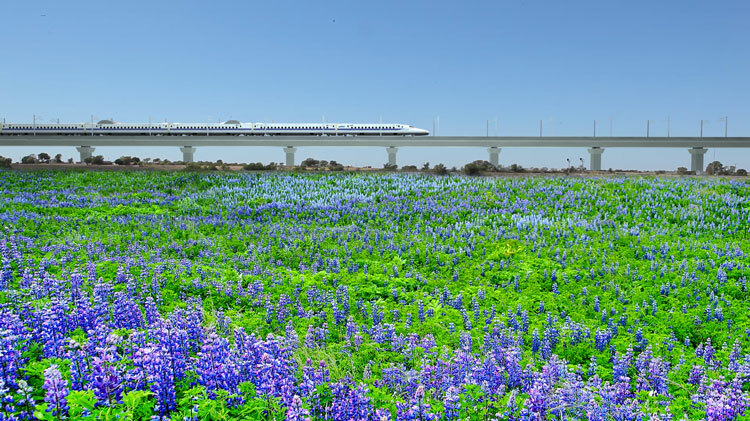 The Texas train will be based on Central Japan Railway’s Tokaido Shinkansen train system, the world’s safest mass transportation system. It has operated for more than 54 years with a perfect record of zero passenger fatalities or injuries from operations, and an impeccable on-time performance record. The Texas project will be built and operated without taxpayer-funded state or federal grants. Texas Central and its partners are refining and updating construction planning and sequencing, guided by the Federal Railroad Administration’s recently released Draft Environmental Impact Statement on the project. That federal review cited many factors in support of the project, saying the train “is needed to accommodate growing demand” in Texas and to provide a more environmentally favorable travel alternative. The FRA now is working on a final environmental review that will help determine the project’s timeline and final route.